This horrifying thing that looks like it belongs on a film set is unbelievably a type of mushroom. 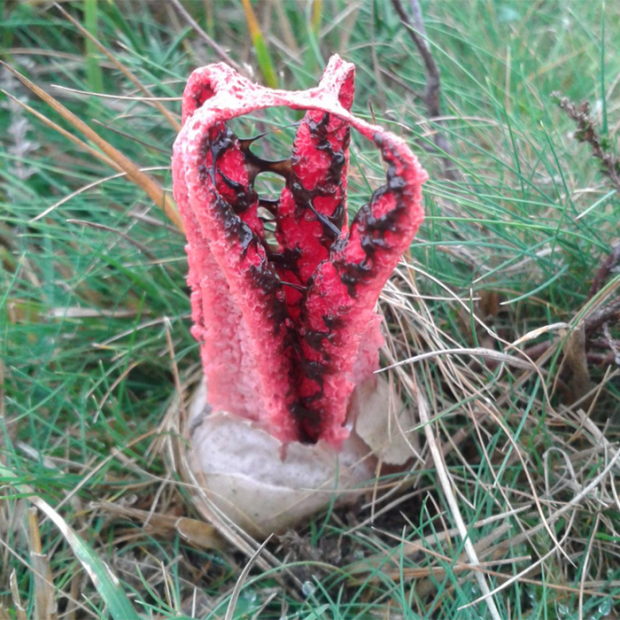 The clathrus archeri fungus, known as the ‘octopus stinkhorn’, ‘phalloid fungus’ and ‘devil’s fingers’ has just been spotted growing in the New Forest. Where most fungi sprout from the earth, the octopus stinkhorn is different, it emerges from an egg, usually around decaying wood chips, old stumps or in leaf litter. Often these slimy, moist, alien-like eggs are found in clusters. The mushrooms originally made their way over from New Zealand and Australia to Europe in 1914 – during the start of the First World War – and was found in Penzance in Cornwall shortly after that, before spreading to many parts of the southern UK. As the mushroom matures, four tentacle-like fingers burst out of the sac, growing to around 5-10cm in length. The four arms are covered in a foul-smelling brown goo, called ‘gleba’, which the creepy fungus uses to attract flies onto which it deposits its spores for the flies to disperse. Although they look like they might kill you, some species of stinkhorn mushrooms are apparently edible in the egg stage and some countries even consider them a delicacy. However, nobody really knows much about eating the clathrus archeri species, but given that its closest relative is suspected to cause eczema, convulsions and cancer its probably best not to add it to your pizza.